I guess this is the price you pay for using Explorer. "It looks like you're about to die...want some help...?" This is what happens when you play Easy mode for too long. It came. Suddenly. Unexpectedly. I came home from school one day and started up my usual internet browsing shenanigans. Then... I heard it. "Onii-chan~ I wanna play with you~ We're always separated by this dumb screen, but now I figure, why don't I just SMASH this screen. We can play forever and ever and ever onii-chan. Just give me a few more seconds~"
Someone whispered. The voice was garbled, as if it was being run through a broken set of speakers. Suddenly cracks. Blood. SHE appears like a haunting after image, slowly gaining clarity. A girl whose name I know all too well. Her twisted smile becoming all the more real. Fear grips my body as I try to scream, yet no sound resonates from my throat, no blood curdling scream or girlish shriek. For what sound could come out of a throat that is no longer there? this sounds like a great day, after all is she's real then so is Remi. I think we need the Hakurei Shrine Crisis Resolution Specialist Team STAT! I'd hate to know what her hands must feel like right now. ... it was damn worth it. you know, i had a dream/nightmare (however you see it) that went like this picture once. Oh? What happened at the end? "Now i become death, destroyer of worlds." that's what goes through my head when ever i look at this now. 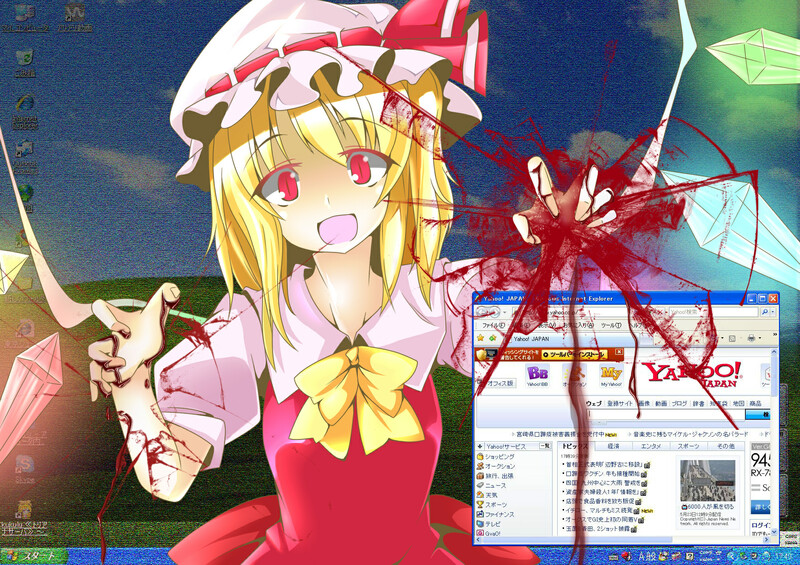 This is what happens when you pirate Touhou. Either one gets you splattered on the wall. B) just gets it done sooner. I dunno. I'd be pretty scared if I saw her coming through my computer screen. REACH FOR THE GUN! REACH FOR THE GUN! TOO LATE RUN! Run or shoot? RUN OR SHOOT? Now I know why some people turn into Luddites. Step 1: Cut power to screen. Step 2: If step 1 failed, cut power to computer. Friend: Hey what's that dot? Friend:Oh My God, What the hell is that thing?!?! Me:*grabs friend* This is a Crisis Situation, You are no longer my friend, just a shield. Shield: Wait, what do you mean by that? Shield: Hey, your actually kinda OH MY GOD MY F**KIN LEG. Before you die you see Flandre. we shouldnt rate this one "safe"
This is the part where I realize that if she can come out, I can go in! damn Your safe now. The rest of us are still gonna die. Well I guess I'll take the easy way out and taunt. Fourth Wall Breaches are not fun. Unless it's Flandre breaching the Fourth Wall. Then, it is very fun. Imma using laptop, folks, so I am not afraid much. SLAM!!! That is a great escape plan. Just don't hope he has to charter a bus for that. I feel like my computer is trying to tell me something.